I have a long list of things to do (washing, mowing, tax return)… But instead, I will be taking off, cutting loose, letting my hair down, being fancy-free (and quite possibly partaking in many other clichéd movie-like holiday activities). Dave and I have bought tickets to the Global Carnival, a three-day world music and culture festival in my hometown of Bellingen, New South Wales. The festivities start on Friday 30 September and we have the week off work. Naturally, this means it’s time for a road trip, the default Aussie adventure. 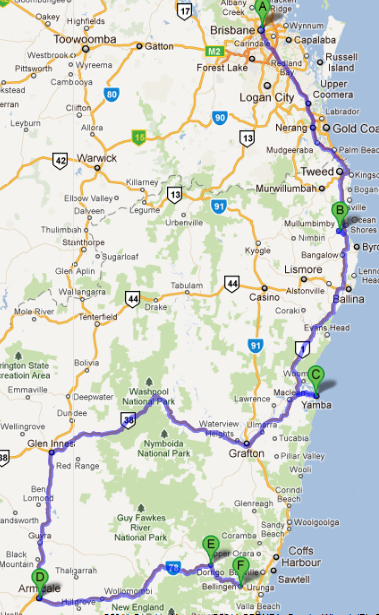 We’ve mapped a road trip route of 763 kilometres… or there abouts. Exploring the Mullumbimby area, with it’s luscious greenness and quaint little towns, shops, eateries. Finding a campground around Yamba somewhere. Suggestions anyone? Descending down into Bellingen from Dorrigo Mountain (in my opinion one of the most beautiful drives). Arriving at my Mum’s house!!!! Meditating, yoga-ing, lazing on the grass listening to world music. So, in short, I’m excited. Time to get moving! I’ll keep you posted along the way. If you have any suggestions for stops along the way, please let me know! Thanks Mary. We are there and back safely. Had a great time catching up with my family and getting away for a bit. We enjoyed staying at the ‘Calypso Holiday Park Yamba’. Sunsets from the van park were great overlooking the water (close to Clarence river mouth) in the direction of Iluka. (Ablutions were good too).